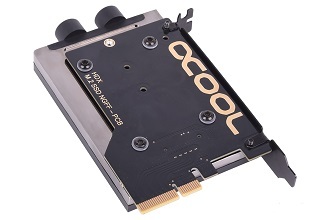 This week Alphacool announced the availability of their new M.2 SSD Coolers, the HDX-2 and HDX-3. 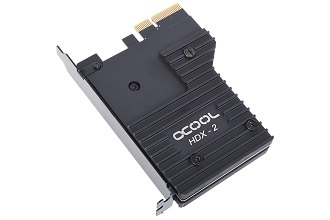 Some may recall the original HDX M.2 cooler was a simple, passive, clip on heatsink for M.2 SSDs, and was designed to help prevent thermal throttling which has a tendency to plague synthetic test results on some M.2 based drives. 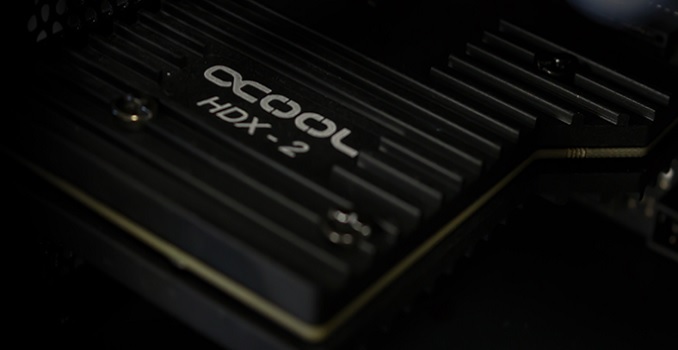 With the advent of the HDX-2 and HDX-3, they have moved beyond the simple clip cooler and to using a PCIe x4 card. This design change allowed a full sized heatsink to be mounted on it giving more surface area to cool the attached M.2 device. The HDX-3 takes the HDX-2 and its passive setup a step further and uses a waterblock instead of the large heatsink to remove the heat created from these SSDs. The dimensions both the of HDX-2 come in at 100 x 81.5 x 20 mm with the HDX-3 being slightly taller at 120 mm while sharing the same width and height. According to Alphacool, the included 4x PCIe card allows a maximum bandwidth of around 3900 MB/s. Existing M.2 drives on the market will not be able to saturate it. Though it is double sided, both M.2 coolers hold one M.2 based device. Contact from the M.2 device to the heatsink is provided by included thermal pads. These thermals pads cover both single and double sided M.2 drives. The HDX-2 and HDX-3 both support up to one 80mm M.2 SSD. Both devices connect to the PCIe slot and mount to the case for a stable platform. Threads N/A 2x G 1/4"
The HDX-2 uses large aluminum heatsinks on both sides of the included PCIe card easily covering the M.2 drive it aims to cool. The heatsinks are black with αCOOL and HDX-2 stenciled on it in white as well as having cooling fins to increase cooling area - the heatsinks cover the entire PCB of the PCIe card. The drive is mounted to the PCB, thermal pads applied to the drive, then mount the heatsink to the board. The HDX-3 block is made of nickel-plated copper with the top made from a single piece of acetal. The block mounts to one side of the PCIe card leaving the other side open. Alphacool says water flows over the entire SSD to help keep things cool. The water enters and exits the block at the opposite end to the PCIe connector using standard G ¼” a threads. Pricing and availability were not listed in the press release. V.92 is better! I bet you're using a softmodem anyway!